As if staying on budget during the holidays wasn’t hard enough, retailers are using dynamic pricing to make it even more difficult. The concept refers to the practice of changing the price of a product based on fluctuations in supply, demand, and even in response to the weather. However, most retailers use dynamic pricing to one-up their competitors. Earlier this year, the price of a microwave oven on Amazon changed nine times in one day, ranging from $745 to $872. That’s over $125 in savings if you bought at the right time — and a really bad purchase if you bought at the wrong one. 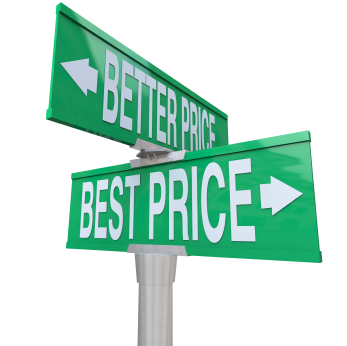 So what’s the best way to navigate fluctuating prices and land the cheapest deal? Consider the following eight tips for hassle-free savings. Sites like Decide.com and PriceGrabber.com are designed to help you determine the best time to buy a desired item. Price histories and product reviews are also available at your fingertips, since each of these sites has an app for your smartphone or tablet. 2. Look for coupons in-store. In addition to shopping during sale time, grab coupons while you’re browsing in-store using the Coupon Sherpa mobile app. The app is free for both Android and Apple devices, and enables you to search for discounts that can be scanned or entered directly from your smartphone. PricePinx is a free service that sends you a notification when the price of a desired product drops.FreePriceAlerts is a browser add-on that helps you find the best price when searching online for products. AndCamelCamelCamel is another browser add-on with price history and price-drop notifications for items on Amazon, Best Buy and Newegg. One of the easiest ways to save money on holiday gifts is to use your credit card reward points toward discounts and gift cards. Some credit cards will offer extra points when you shop at select stores, and others will offer discounts on gift cards to specific retailers. Ultimately, it’s best to call your credit card company to determine what specials and extra savings are available. 5. Get a price match. Stores such as Target and Best Buy are matching Amazon prices this holiday season, and Lowe’s and Home Depot usually duke it out for customers by offering price match “plus,” or 10-percent off their competitor’s better price. Ultimately, it pays to shop around and ask store managers about price-matching options. Use a barcode-scanning app like RedLaser to determine what a product costs at local stores and online retailers. 6. Ask for a price adjustment. Some stores offer price adjustments on products that drop in price after your purchase. Timeframe is always a factor, so keep your receipt and track the product’s price two to four weeks after you purchase it. A friend of mine received $25 back when the artificial Christmas tree she purchased for $75 dropped to $50. Extended warranties and expedited shipping are just two of the many add-ons that increase the price of your product. The basic warranty is typically sufficient, especially if the credit card you’re using has additional coverage. And, events like Free Shipping Day on Monday, Dec. 17 make it easy to order last-minute gifts while dodging delivery fees. 8. Review your credit card perks. In addition to rewards, some credit cards offer price guarantees. These guarantees make qualifying purchases eligible for a partial refund when they drop in price during a certain timeframe. This is different than a price adjustment because it’s issued by your credit card company, not the retailer.